What’s in the New Japan-Malaysia Defense Pact? Both countries inked a security agreement in a boost for the defense side of their ties. This week, Japan and Malaysia inked an agreement on defense collaboration. The signing of the pact marked just the latest effort by both sides to further boost their security ties, an effort that is continuing following the election of a new government in Malaysia which saw the return of former premier Mahathir Mohammad to power. As I have noted before in these pages, Malaysia has a longstanding security relationship with Japan, with both countries sharing a number of concerns on the defense side as well, including but not limited to China’s rising maritime assertiveness in the East China Sea and South China Sea. The strategic partnership that the two countries inked back in 2015 contained a heavy security focus as well, which included not only an increased focus on engagements like exercises but also Japan helping boost Malaysia’s capabilities through more advanced transfers of defense equipment and technology and other forms of knowledge sharing and capacity building. The pattern of strengthening defense collaboration as part of wider bilateral ties has continued on into 2018 as well, with developments such as the signing of a new agreement on the transfer of defense and technology back in April. The new government in Malaysia that took power earlier this year, which saw the return of Mahathir to the helm, has also shown a commitment to continue boosting Malaysia-Japan relations, which had been a major focus for Mahathir during his previous tenure as prime minister under the banner of the so-called Look East Policy. On September 11, in another example of the ongoing activity within the bilateral defense relationship, both countries signed an agreement as part of their ongoing security ties. During a visit by Malaysia Defense Minister Mohamad Sabu to Japan, which included a number of engagements including a defense meeting chaired by him and his Japanese counterpart Itsuri Onodera, both countries inked a memorandum of understanding on defense cooperation. 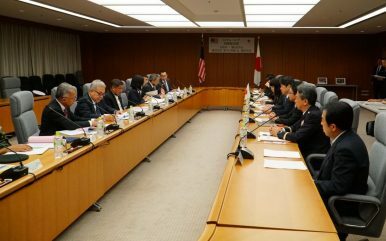 Mohamad framed the significance of the agreement during his Japan visit in broad terms, noting that such pacts serve as umbrella agreements around which collaboration can occur, and that Malaysia also recognized Japan’s longstanding significance as a security partner in areas ranging from defense equipment to peacekeeping. Unsurprisingly, few specifics were provided on the detailed contents of the agreement. But viewed in wider perspective, the pact represented yet another indicator of continuity with respect to the commitment of both sides to strengthen their defense relationship, which is continuing under the new Malaysian government as well. A recent engagement put the focus on ongoing work by the two sides to advance defense relations.